11. The herbs are over-muddled. We’re not making pesto, and a muddler is not a mortar and pestle. All of the menthol in mint lives in little hair-like structures on the surface of the leaf. If you bruise the leaf of the mint, you are going to release bitter chlorophyll flavors into your drink, and it will taste grassy. I suppose that could be deliberate, but a discerning palate will perceive it as an error. The better way to handle mint is to place it on the palm of your hand and give it a few good, hard, smacks. In general, when muddling herbs or citrus peels, apply firm pressure but do not tear the flesh of the plant. Fruit, on the other hand, ought to be pulverized. The drink that my friends described to me contained reposado tequila, yellow Chartreuse, lime juice, muddled sage, and ginger beer. I do not know the exact proportions of the drink as it was served at Prohibition, but by knowing a little bit about the construction of a highball, we can come pretty close. In most cases, we want to have a total of two ounces of hard liquor in the drink, and the very natural way to do this, in this case, is with one and a half ounces of the base spirit, tequila, and one half ounce of the modifier, yellow chartreuse. I want the flavor of the yellow chartreuse to be balanced against the acidity and flavor of the lime juice, so in this case I also used a half ounce of lime juice. Depending who you listen to, you might end up with three quarters of an ounce of liqueur, for a sweeter drink, but I like them dryer, and I plan to add more sugar in the form of ginger beer. When topping a drink with soda, many people make the mistake of filling the glass. This makes it look pretty, but you will end up putting a highly variable amount of soda into the drink, depending on the glass you use. If you want to preserve the flavor of the other elements, it is best to measure. You can always add a little more, so I limited myself to one ounce of soda water. We made this drink after my friend Julian had just finished moving into a new apartment, so the name was appropriate. Moreover, it was a hot summer day, so whereas I usually would have used ice cubes, I wanted this drink to be a bit lighter and more refreshing, so I used crushed ice instead of ice cubes. In either case, as we discussed yesterday, it is important to fill the glass completely full with ice, to slow the melting process as much as possible. The ice does not look especially crushed in this picture, but I assure you, it was. Julian’s cat, Mimosa, wanted in on the action. 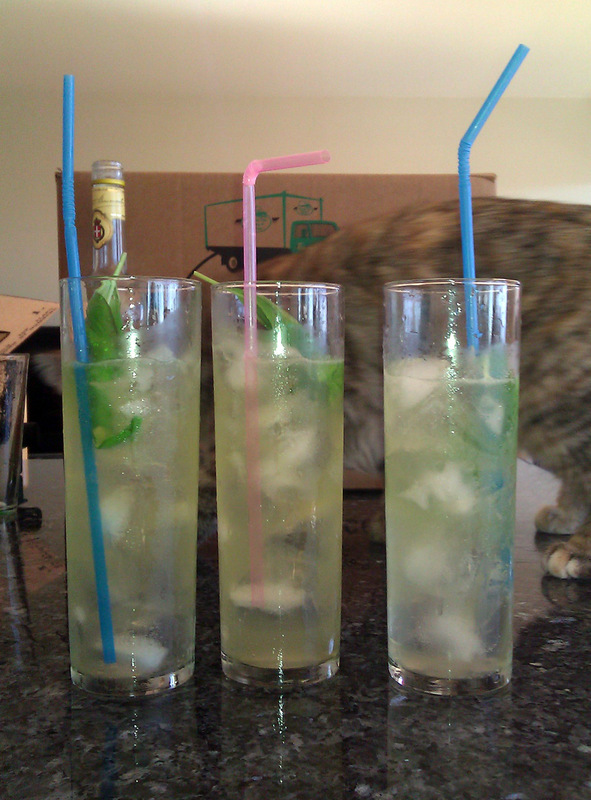 Lightly muddle the sage leaves in the yellow Chartreuse, and then combine all except the ginger beer in a shaker. Shake over ice, and then strain over fresh ice. Add the ginger beer and Garnish with a sage leaf. I did not have any sage at this particular juncture, but I did have basil, fresh off the plant, and it was close enough on this occasion. I also substituted Strega for yellow Chartreuse, and you can see the bottle poking it’s head up in the background. I like to bring my own ice when I’m mixing at a remote location, because the quality of the ice is critical to the quality of the drink. Categories: modern drinks | Tags: alcohol, basil, booze, Bundaberg, cocktail, cocktails, drinking, drinks, ginger beer, herbs, highball, liqueur, liquor, mixed drinks, mixology, Prohibition, reposado, Reposado Tequila, rocks drinks, Sage, San Diego, spirits, strega, tequila, Yellow Chartreuse | Permalink.